You have those bands that come and go in the blink of the eye, who end up showing up on shows like Where Are They Now? and the like. This is the predicament facing the members of Boytown who had their heyday and after a remake of one of their songs decide that it is time to renew the bonds with their fans with some quite funny results. You see, the world has changed since Boytown were popular and the younger generation quite frankly are not warming up to the new hip tunes being done by the group. So it’s time to appeal to their old fans with song more relevant to their aging fanbase. This for me is where the fun truly begins. The comedy in this movie is more of a gentle nature and I personally did not find myself belly laughing all the way through the way that I had expected. During songs however, the lyrics are so ridiculous that I was in stitches for most of them. Songs about middle aged issues are not what I expected and the performances given have to be seen to be believed! Of course with newfound popularity, issues from the past make their way up to the surface and complicate the triumphant return of the band. This purely ramps up the laugh factor for us the audience. This is one of these flicks that is a bit slow with moments that are genuinely hilarious. The script is well put together with great character building moments and the leads truly hold their own throughout. Possibly the only thing that goes against the movie is the fact that there are a number of flicks before it that will have people expecting a certain type of movie which may disenfranchise. 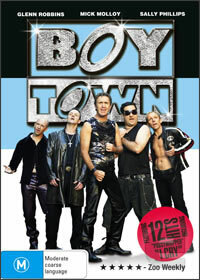 This disc is packed with fun extras that really give you the feeling that Boytown was in fact a real band. The disc has deleted scenes, audio commentary, videos, interviews with the band and a whole swag of other features well worth the watch. This is a selection that you would be doing yourself a disservice by missing. Check out the movie, it’s worth checking out.